F. Scott Fitzgerald famously said that he left Saint Paul as soon as he could and only returned when he had to. This less-than-kind thought occurred to me as I headed back to the place of my birth, the famed Twin Cities straddling both sides of the mighty Mississippi River, returning some 60-odd years after I left for the sunny climes of California. You’d hardly recognize the place! The Minneapolis Convention Center, site of this year’s Homebrew Con, aka the 39th annual National Homebrewers Conference, is a large, modern amalgam of rooms and halls that are conveniently interconnected with the hotels a few blocks away. This connection is due to the area’s bitter cold and snowy conditions in the winter, when the cities become human habitrails of interconnected walkways several stories above ground so people don’t have to go outside. The Homebrew Conference was being held in mid-June, so temps were in the high 80s with some humidity as a bonus. It even sprinkled one day. The habitrails came in handy. The three-day conference brought together some 2,500 homebrewers, the cream of the crop of seasoned and expert practitioners of fermentation, along with a share of eager newbies. 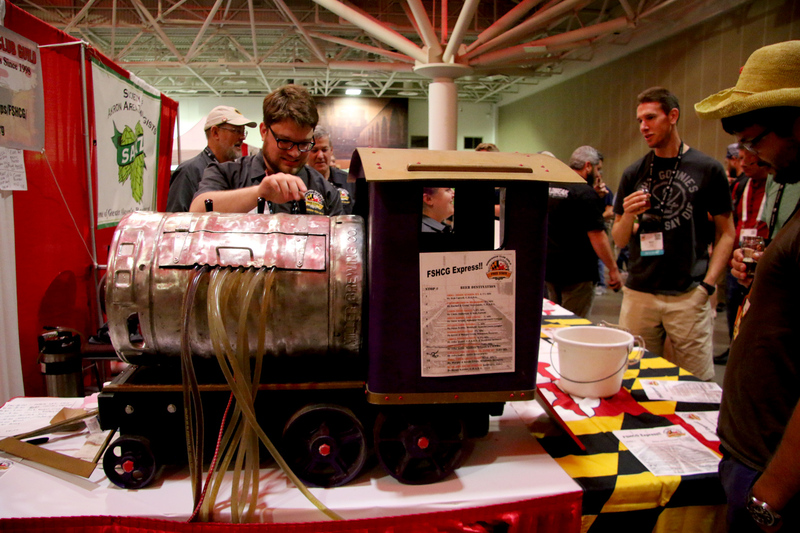 The three-day conference brought together some 2,500 homebrewers, the cream of the crop of seasoned and expert practitioners of fermentation, along with a share of eager newbies. 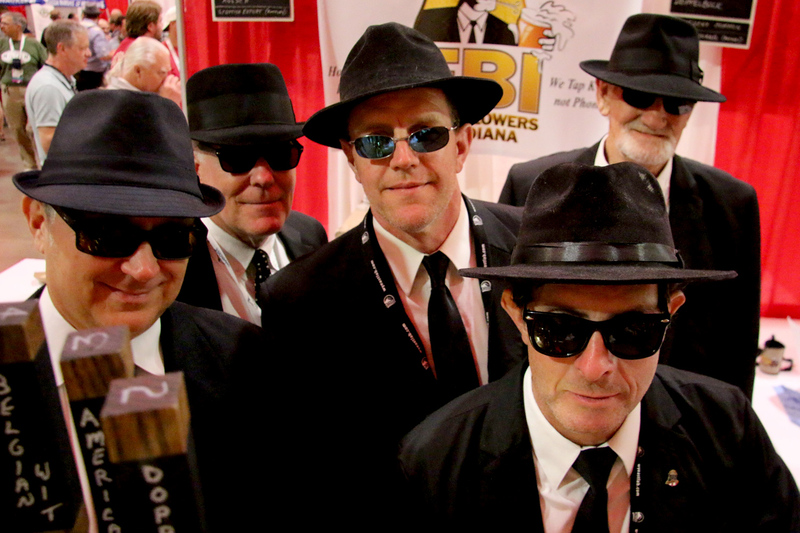 Presentations and classes, plus a full trade show featuring the latest homebrewing supplies and equipment, went on during the daytime, with some compelling beer tastings from the “pros” one night and “Club Night” on another night. 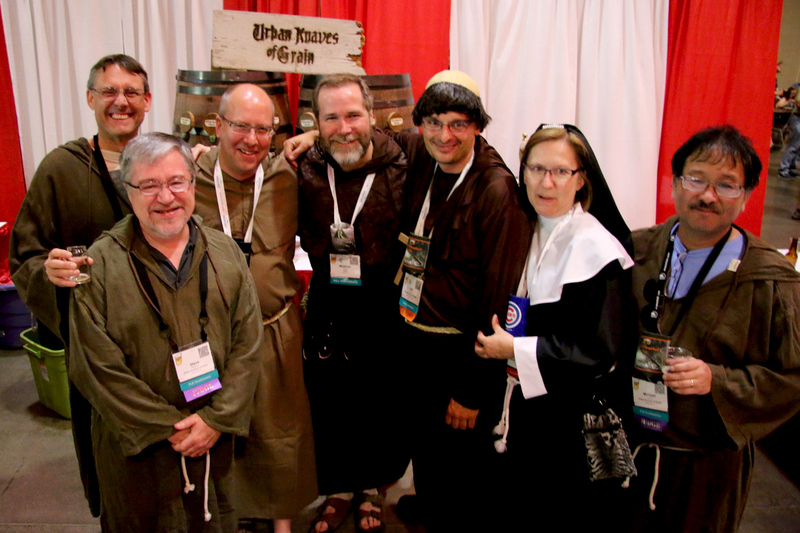 The nation’s top homebrew clubs from around the country were vying for favor and awards for best costumes and booths and offering up great beer, cider and mead, served to all for the asking. The full program is available at homebrewcon.org. I was invited by the Brewers Association to interview Charlie Papazian, the man who started it all literally before homebrewing was even legal, as part of the Friday program. I’ve known Charlie since 1990, when his collection of Boulder, Colo.-based organizations were helping homebrewers and pro brewers alike make their way in a sometimes inhospitable world of unfriendly regulations and special interests. 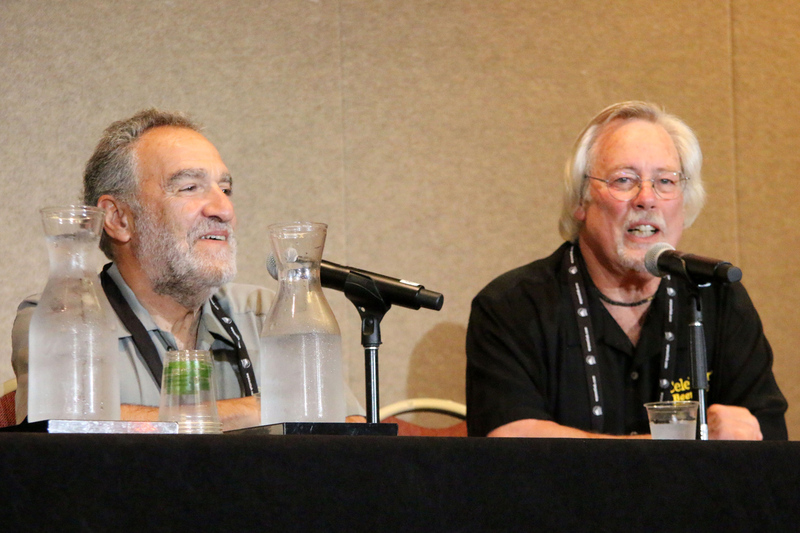 Our presentation was called “Homebrew Disrupts American Beer: A Live Interview with Charlie Papazian.” Ably assisting me and serving as emcee was homebrewer Chip Walton, who works for American Public Media. Together we got Charlie talking on a variety of subjects and reminiscing about his 47 years of finding his way from homebrewing to pro brewing to organizing some of the largest beer festivals and professional conferences in the world, including the Great American Beer Festival and the World Beer Cup competition. His Craft Brewers Conference meets in a different part of the country each year, bringing thousands of professional brewers and brewing hopefuls together for educational presentations and an amazing trade show with every kind of brewing device and beer-related accessories imaginable. Papazian’s seminal work, The Complete Joy of Homebrewing, Fourth Edition, was first published in 1984 and is considered “the Bible of homebrewing” by many. It is the all-time best-selling book on brewing at home. Charlie’s mantra, “Relax, don’t worry, have a homebrew,” is the guiding principle behind his scientific approach to consistent brewing in the home. Charlie Papazian’s mantra, “Relax, don’t worry, have a homebrew,” is the guiding principle behind his scientific approach to consistent brewing in the home. This year’s homebrew competition had 8,618 entries from 3,530 homebrewers located in all 50 states; Washington, D.C.; and 13 other countries. The final round of judging took place at Homebrew Con, where 1,134 entries were evaluated by some of the top beer judges in the country. In contrast, the first competition was held in 1979 in Boulder, Colo., where 34 beers were judged. 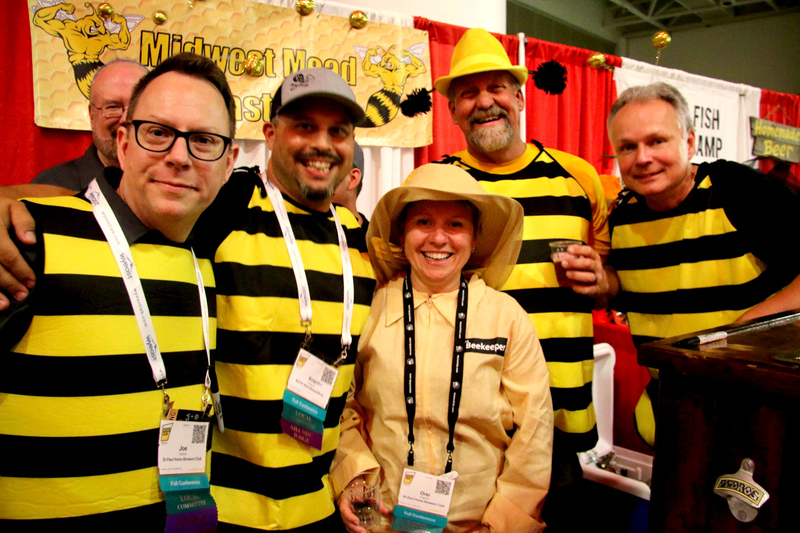 This year’s winners included Zach Kosslow of Wilmington, N.C., who earned the Homebrewer of the Year Award; Michael Wilcox and Amy Satterlund of Wichita, Kan., who won the Cidermaker of the Year Award; and Scot Schaar of Davenport, Iowa, who received the Meadmaker of the Year Award. QUAFF (Quality Ale and Fermentation Fraternity), based in San Diego, won the NHC Homebrew Club award, and Cane Island Alers (CIA), based in Katy, Texas, won the Gambrinus Club Award. Jeff Poirot and Nicholas McCoy of Fort Worth, Texas, won the Ninkasi Award for accumulating the most wins in the competition. In 2018, homebrewers will meet in Portland, Oregon, on June 28–30 for the 40th rendition of the event.